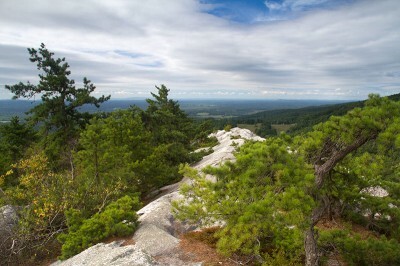 A short, fun, challenging rock scramble up Bonticou Crag and a hike to Table Rocks in New York's Shawangunks. Our two cents: The Bonticou Crag rock scramble and the views from the top are the stars here and are a must-do. The rest of the hiking in this area is ok and while Table Rocks is worthwhile and has a nice view – it's not overly enthralling. Explore an ice cave, a waterfall, and enjoy spectacular views of the Shawangunks region and the Catskill mountains. SOme highlights of these 300 miles! Hi NJ Hiking Gang. I haven't given up posting here - I've been in the woods hiking! Started a Southbound thru hike attempt on July 9th, and just recently (9/3) entered Massachusetts. 600 miles down, 1580 to go! Here's some highlights of Maine. It's no Jersey of course! Plenty of views and a few old mines on a hike up Black Rock and Hogencamp Mountain in Harriman State Park, NY. Late August is usually hot so we'd planned a bike ride, but when the forecast showed hiking weather we quickly switched gears and opted for a hike. We’d done this route just once, in March of 2010 (“Norvin Green – Lake Sonoma and Overlook Trails”). There were several expansive viewpoints so we wanted do it again when everything is in bloom. This hike was an example of why it’s good to have a backup plan or at least know of nearby hike options. Bearfort Ridge is one of our favorite hikes because it’s consistently enjoyable. We’re the first to admit that even some of the best routes have some boring stretches or areas that lack a little in the scenery department that you overlook because of a great destination. Great park. Perhaps not the best day hiking spot, but good campground and Saturday night fun at the observatory. 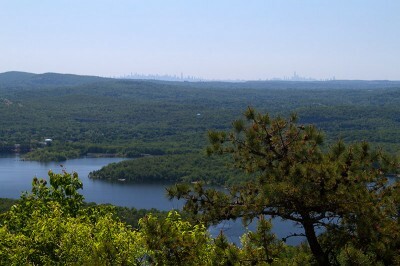 For detailed hike directions, maps, GPX, and photos, visit our “Norvin Green State Forest” page. Norvin Green is one of the best areas in the state for hiking, in our opinion – it has a network of rugged trails with plenty of expansive views and some nice waterfalls for payoff. For us, a holiday weekend means heading in the opposite direction of Jersey's beach traffic. We’d just had a lot of rain so we went west on Rt. 78 to check out Musconetcong Gorge’s cascades. We only had Sunday available to hike so – of course – the weather threatened to be iffy. So we opted to hit up Jockey Hollow where we could get a decent hike in but it’s only just over an hour drive away. Headed up to Stokes for the 3rd annual “May Days” cabin outing on Friday, May 2nd. This year I had bagged my 1st choice - cabin #6. It’s a great waterfront location with a neighbor on only one side and a nice picnic table/fire ring backyard. The only issue at #6 is waterfront access which is very swampy and unuseable, but that’s pretty much true of all the cabin sites. March was dubstep, April is ragtime. I'll be doing spoken word by the fall! Great hike, lots of views and lots of history. And hopefully the end of cold weather camping for 6 months. After poking around some older pages in the site, I decided Beaver Brook and Lost Lake would be good to revisit. A new trail map for Apshawa came out last September, and while it's not unusual for trails to change, there are some huge differences since we last hiked this in Nov. 2010 ("Apshawa Preserve").